The shuttle Discovery will spend another week inside its processing hangar at Kennedy Space Center due to cold temperatures in Florida, likely forcing a launch delay until early April. Discovery's rollover to the Vehicle Assembly Building to meet a waiting external fuel tank and solid rocket boosters is now scheduled for no earlier than Feb. 22, a NASA spokesperson said. The shuttle was originally scheduled to move to the cavernous integration building Feb. 11, but a spell of cold weather in Florida held up those plans. According to NASA, temperatures can't dip below 45 degrees Fahrenheit for more than four hours between the time Discovery leaves the hangar and when it it attached to its orange bullet-shaped fuel tank. The cold conditions could damage Discovery's maneuvering thrusters because the shuttle will not be hooked up to heating purges as it is lifted by massive cranes inside the VAB. If Discovery leaves its Orbiter Processing Facility bay Feb. 22, the shuttle is slated to make the 3.5-mile trip to launch pad 39A on the morning of March 2, according to a NASA spokesperson. The rollover delays threaten to push Discovery's launch to the International Space Station until after the next long-duration crew arrives at the outpost. The next group of residents -- two Russians and one American -- are scheduled for launch on a Soyuz rocket early April 2. The crew will reach the orbiting lab complex two days later. NASA does not want a space shuttle present at the station when other spacecraft dock to the outpost. Discovery's liftoff is still officially set for March 18, putting the shuttle's departure from the station on March 29. Discovery would have to leave the complex by around April 3 to clear the way for the docking of the three-person Soyuz capsule. If Discovery's launch slipped five or six days, NASA would likely opt to reschedule the mission until early April, after the Soyuz docking. The first launch attempt could be April 4 at about 6:45 a.m. EDT (1045 GMT). 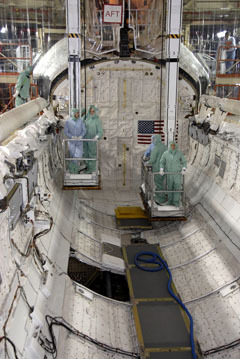 Discovery's STS-131 mission will haul a resupply module full of science gear for the space station. Led by commander Alan Poindexter, the seven-person crew will also conduct three spacewalks to replace parts outside the complex. Joining Poindexter aboard Discovery will be pilot James Dutton and mission specialists Clayton Anderson, Rick Mastracchio, Dorothy Metcalf-Lindenburger, Stephanie Wilson and rookie Japanese astronaut Naoko Yamazaki.